Today is the first day of March Madness which means basketball ALL DAY LONG. And I confess that I’ll watch these games ALL DAY LONG. However, I got up and got some stuff done before the tournament started. I did maintenance on my two worm bins (mite infestation YUCK) and worked on my writing project. But since then I’ve been parked in front of the television, switching between games (where there have already been two nail-biters, yo). In my defense, I am multi-tasking. Here I am shredding newspaper for the worm bins. 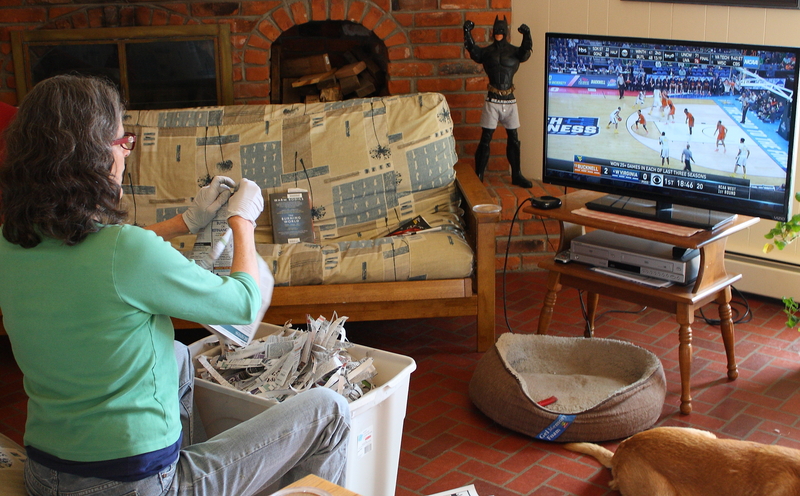 Not only does it relieve some guilt regarding the time I devote to watching men’s college basketball, it turns out that ripping paper into strips is a good way to let off steam when the team I’m rooting for is behind.